Excava cleverly combines the beautifully raw features of rust and concrete in a low-reflective matt surface finish. Oxidized steel, weathered cement and rough-hewn timber are the new stars of commercial spaces, from hotels and bars to restaurants and retail spaces. 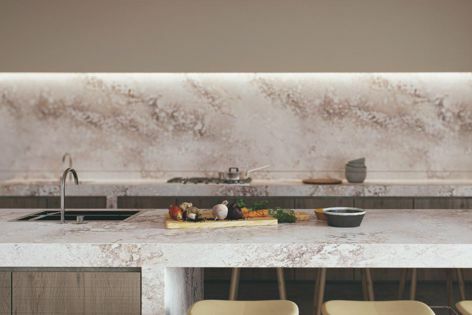 Caesarstone’s Excava quartz surface both emulates and enhances this look while delivering the robust durability required of any high-traffic area.